A letter from the Queen? A book would perhaps be more appropriate; for this year, Hove Library turns one hundred. The story starts in neighbouring Brighton when a reference library was created in the Royal Pavilion, later opening to the public in 1873. Although it would have been hard to match the Pavilion’s lavish settings, Hove’s first library at 11 Grand Avenue would have been more than adequate upon its opening in 1892. A move to purpose-built premises soon became necessary though and Andrew Carnegie, the Scottish-born American steel baron, made the move possible. The new purpose-built Library, now Grade II Listed, opened on 8th July 1908 at a final cost of £13,500 on the site of a council depot at 182-186 Church Road. Of this, Carnegie paid £10,000. It was built in a Renaissance style to the designs of Percy Robinson and W. Alban Jones. Two major changes have taken place since it was built; namely the addition of the Wolseley Room to the rear in 1925 and the removal of a beautiful cupola on the front of the building for safety reasons in 1967. 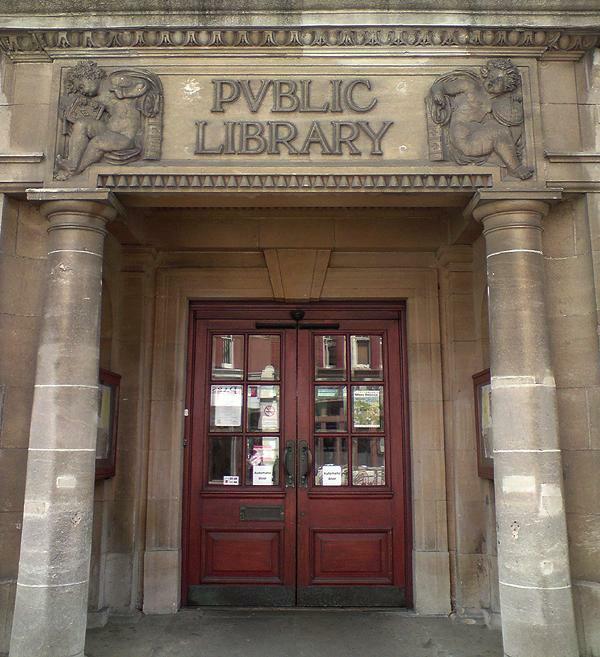 The PVBLIC LIBRARY’ sign above the main door was only uncovered in recent times as was the grand internal staircase’s brass handrail. A plastic white sign and pink paint covered each respectively! Incidentally, the ‘V’ stems from the Roman alphabet, used on many of Carnegie’s donated buildings. In 2003, Hove Library came under threat when a move to Hove Town Hall was on the cards. 5,000 yellow posters, courtesy of Christopher Hawtree’s Friends of Hove Library, soon put a stop to that. A much-needed interior renovation soon followed and a lift was sensitively installed to provide disabled access to the first floor. The works cost £350,000 – a reflection of, to be quite frank, years of dithering. It was discovered during the works that a considerable section of the logical basement floor space was missing, raising the possibility of there being a large void. Other hidden areas include the Upper Gallery and Lower Gallery, filled with thousands of back issues of publications dating back over the past century or so. Various celebrations are planned for the birthday but Natalie Gore brought the best present in the form of a slick but quirky mural in the children’s section. I don’t know yet what I’ll be bringing to the party. A campaign for a new cupola perhaps?